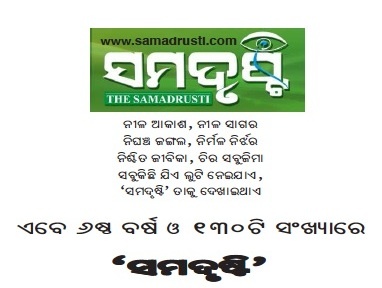 Orissa’s well-read fortnightly, Samadrusti will be available on the Net from June 30, when its sixth annual day would also present a printed compilation of an index of all its issues published so far. Noted Gandhian scholar Satya Narayan Sahu will formally launch its web edition and deliver a talk on non-corporate media and the future ahead. The function shall be celebrated at Lohia Academy auditorium in Unit 9, Bhubaneswar. Its Editor Sudhir Pattnaik has invited its contributors, readers, patrons and the public to please participate in the programs at 6 in the evening. We congratulate Samadrusti and wish it all success on this memorable occasion.